Westport brands offer fleets direct injection liquefied petroleum gas (LPG, or propane autogas) systems for mono, bi- and dual fuel applications, compressed natural gas (CNG) or liquefied natural gas (LNG) systems, components and more. Westport has a strong background in engineering the most advanced natural gas engines and vehicles for OEM customers. 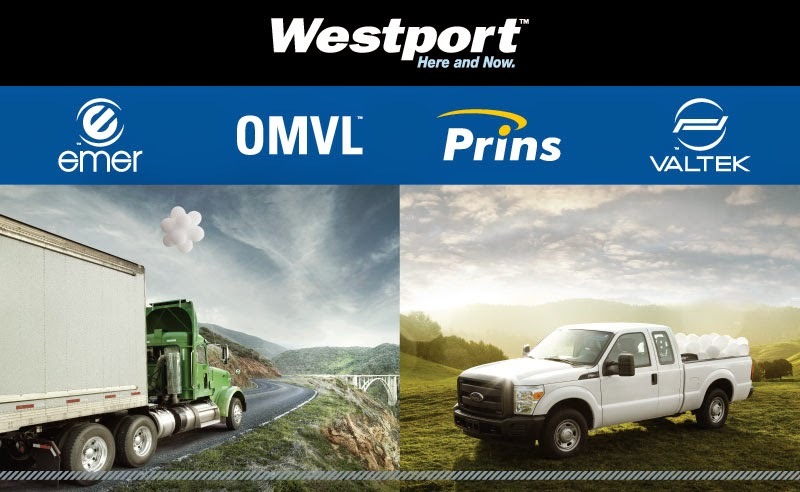 Therefore Westport – including Prins, Emer, OMVL, Valtek – can offer you an even bigger range of high quality products optimized for CO2 reduction, particulate reduction and saving fuel costs. Emer, a key partner for OEM customers, designs and manufactures a wide range of systems, sub-systems and components that offer green energy solutions for both engine and platform applications. Emer’s range of lower emission products include bi-fuel systems, mono fuel systems with Westport WP580 ECU, and diesel dual fuel (DDF) known as Poseidon system – ensuring that each fleet has access to warrantied fuel system options that meet its unique needs. OMVL has more than a quarter century experience in continuously improving product offerings so its customers can enjoy the highest level of efficiency and effectiveness, including conversion systems, fuel systems, reducers, ECUs, accessories and parts. OMVL supports customers in more than 40 countries around the world, specializing in pressure regulator devices such as the latest LINX LPG Reducer and injection rails such as the recently-launched Gemini Injector. Prins has developed award-winning products in many markets and applications. Prins offers high-tech sequential gaseous injection systems (VSI) for both LPG and CNG applications, direct (liquid) LPG injection systems (VSI-2.0 DI, DLM-2.0) and Heavy Duty Diesel Dual Fuel systems for replacing diesel with LPG/CNG/LNG. Valtek designs, develops and produces safety solenoid valves, injectors and filters for CNG and LPG automotive applications, with exports to more than 30 countries world-wide. Find Westport companies Prins, Emer, OMVL and Valtek March 5-6 in booth L1 at GasShow 2015, at the International Expo Centre XXI in Warsaw, Poland. More information on the show can be found at http://gasshow.pl/en. For Westport media enquiries, contact media@westport.com.